It is difficult to assess Crisps in comparison to Walkers Extra Crunchy. They are undoubtedly among the best balanced Crisps we have come across in the UK. They do not splinter and shatter like some Hand-Cooked Crisps. Neither do they mush up like Walkers Regular Crisps. The munch degrades in a balanced and well paced fashion and finishes up with a flavour burst at the end. As these are slightly more thickly cut than Regular Crisps, the curls and bends may be slightly less evident, but they are there, as are the prolific oil boils. There is skin on edges and browning in some areas. It would be unfair to say that a Nose Plunge Test turned up an aroma a bit like a dusky room, but it wasn’t exactly Cheesy. As for the flavour, well, we have a confession. 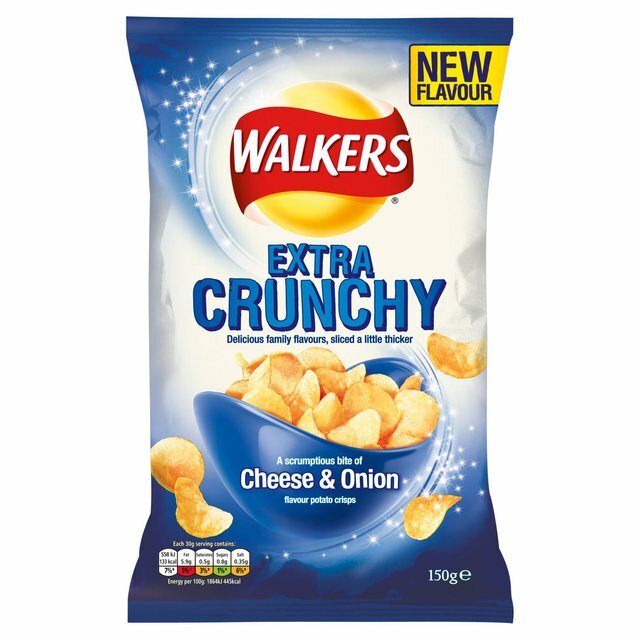 We have been very impressed with Walkers Extra Crunchy range, with the Salt and Vinegar and Sour Cream & Onion flavours especially dominant among their peers. For some reason Cheese & Onion was not among the first batch of flavours in the range, so when it did arrive we anticipated a historic reference point – as one of the World’s first producers of the flavour all it had to do was match up with their other flavours and it would be one of the best in the country. And so after that little ramble... It was average. The Cheese dominated a mild Onion to provide a very nice and welcoming flavour. It was almost winter warming in its nature. What it did not do was slap us around the face with its stand-out flavours, competing with each other to force dominance. Maybe we were just expect a little too much.